To The Thriller Spy Novel. This short list of books and articles, about the history of tea, is just that, a very short list. Use your favorite search engine to find a wealth of vendors for these publications or to uncover similar books. The China Tea Book covers everything from the leaves to the pervasive culture they spawned. As the trade of tea took off in the 16th century, the associated health benefits and cultural expressions spread around the world. The etiquette of tea drinking and the art of tea brewing may be centuries old, but understanding them leads to a deeper appreciation of the now ubiquitous drink. Designed for leisurely reading yet eminently practical. An excellent companion for those who have an interest in Chinese tea and its rich traditions. Learn about the history of Chinese tea, the ten most popular Chinese teas and the Oriental philosophies and wisdom behind drinking tea. This book introduces the delicately crafted art of the tea ceremony and the etiquette of drinking tea at a traditional tea house. It also teaches the reader how to prepare Chinese tea at home, along with touching upon the health benefits of tea. In All the Tea in China, you will learn everything about Chinese tea for practical uses, as well as for meditation. Discover the history of tea, its different species, production method and drinking etiquette. Also, through the vivid illustrations, readers will gain information about what tea is and how to identify a good quality kind. At the same time, the quotations, poems, sayings, and stories in the book are presented chronologically so that readers can appreciate what tea has inspired and why it continues to delight the Chinese people. China is the homeland of tea, taking a leading position in the planting, producing and drinking of tea. The book describes many aspects of Chinese tea such as its types, producing procedure, utensils, taste, ceremony, drinking customs and philosophy. Color photos throughout the book. 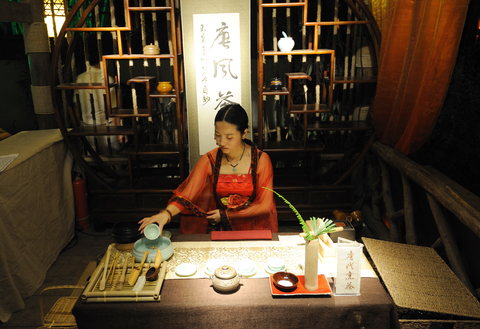 Stories and myths surrounding tea culture and how people embraced tea in ancient times. An introduction to the Tao of Chinese Tea, the philosophy of drinking tea that first appeared in a Chinese poem during the Tang Dynasty more than one thousand years ago. An explanation of the art of tea, which illustrates how tea drinking can be regarded as a representation of Asian culture. A practical guide to the most popular Chinese teas, how to select them, and an overview of the utensils used for brewing and presenting. With more than 200 photos and illustrations, you'll see the evolution of tea through the ages and get a detailed look at the process of making the different varieties of tea. Tea is often thought of as being a quintessentially British drink, and we have been drinking it for over 350 years. But, in fact, the history of tea goes much further back. A Japanese tea master discusses his art and throws in a few anecdotes of his life and stories about famous tea masters from the past. Overall, this is a wonderful introduction to the spirit of the tea ceremony, which as just as important as the particulars of the process itself. The author's warmth and sincere goodwill come through nicely in this slim, peaceful volume. This elegant book explores the aesthetics and history of the traditional Japanese tea ceremony, examining the nature of tea collections and the links between connoisseurship, politics, and international relations. It also surveys current practices and settings in light of the ongoing transformation of the tradition in contemporary tea houses. Written in 1906, The Book of Tea is still beloved the world over. Interwoven with a rich history of tea and its place in Japanese society is poignant commentary on Eastern culture and our ongoing fascination with it, as well as illuminating essays on art, spirituality, poetry, and more. The Book of Tea is a delightful cup of enlightenment from a man far ahead of his time. A description of the Japanese tea ceremony that evokes Eastern culture as a whole. The author follows the history of tea and its drinking practices from their arrival in Japan to the time of Rikyu, considering at each stage the relevant historical changes and their significance for the Way of Tea. Shortly after its arrival during the Heian era (794-1185), tea was celebrated by Japanese poets, who attributed the same spiritual qualities to the beverage as had their Chinese contemporaries. During the medieval era, however, tea began to take on a distinctively Japanese character. Eisai (1141-1215), the founder of the Rinzai sect of Japanese Zen Buddhism, accentuated the medicinal aspect of tea and saw it as a means of salvation in a spiritually degenerate age. From Darjeeling to Lapsang Souchon, from India to Japan - a fresh, concise, world-encompassing exploration of the way tea has shaped politics, culture, and the environment throughout history. From the fourth century BC in China, where it was used as an aid to Buddhist meditation, to the Boston Tea Party in 1773, to its present-day role as the most consumed substance on the planet, the humble Camellia plant has had profound effects on civilization. Whether it's a delicate green tea or a bracing Assam black, a cup of tea is a complex brew of art and industry, tradition and revolution, East and West. In this sweeping tour through the world of tea, veteran tea traders Mary Lou Heiss and Robert J. Heiss chronicles the history of tea and its influence across the globe and provides a complete reference for choosing, drinking, and enjoying this beverage. THE STORY OF TEA begins with a journey along the tea trail, from the lush forests of China, where tea cultivation first flourished, to the Buddhist temples of Japan, to the vast tea gardens of India, and beyond. By the middle of the nineteenth century, the British East India Company faced the loss of its monopoly on the fantastically lucrative tea trade with China, forcing it to make the drastic decision of sending Scottish botanist Robert Fortune to steal the crop from deep within China and bring it back to British plantations in India. Fortune's danger-filled odyssey, magnificently recounted here, reads like adventure fiction, revealing a long-forgotten chapter of the past and the wondrous origins of a seemingly ordinary beverage. From the plantation to the breakfast table the stimulating history of the world's obsession with tea from its first discovery in China to the present day. Moxham first became fascinated by the history of tea when he applied for a job to manage a plantation in Nyasaland, Africa. His book is a historical journey which includes all levels of society from the royal family to plantation slaves, revolution, and the afternoon ritual. The story he uncovered reveals a fascinating, and occasionally brutal, insight into the history of the British Empire. This book is the personal story of six years spent as an assistant manager on tea plantations in the beautiful and historic island of Ceylon, now Sri Lanka. The European tea planter is now a figure of history, and his way of life has long vanished. This book describes a planter's daily life, the events experienced and the post-colonial social scene with humor as well as candor. Historical and literary aspects are included where these are relevant to the story, and the wonderful natural history of the Island is brought to the attention by a keen naturalist. The production of black tea in Ceylon began after a deadly fungus destroyed most of the coffee crop on the island. The coffee plantation owners realized that they needed to diversify. James Taylor had acquired his tea knowledge in North India and carried out different experiments on cultivating tea. He rolled the leaves by hand and fired the oxidized leaves on clay stoves over a charcoal fire. The tea was delicious and sold at a very good price in the London Auction. The rise of British rule in India is a problem for history. A single association of British traders established businesses that grew into fortresses and governed native towns that became capitals of the British Empire. The march of events is without parallel in the annals of history. This book is a popular history of one of the world's most famous companies. Founded in 1600, the East India Company was the forerunner of the modern multinational. Starting life as a trader in Asian spices, the Company ended its days running Britain's Indian empire. In the process, it shocked its contemporaries with the scale of its violence, corruption and speculation. This is the first-ever book to expose the Company's social record. Robins reveals a hidden story of tragedy and intrigue. War, famine, stock-market bubbles and even duels between rival executives are all to be found in this new account. For Robins, the Company's legacy provides compelling lessons on how to ensure the accountability of today's global business. The history of tea many call the history of the world.